I'm going out on a limb here to say, "Yes." For me, flavored vodka stops at fish. Fish? Fish! And we're not talking just any fish here. We're talking Alaskan Salmon. To make their fishy vodka, they smoke the fish using a secret process. Then they remove the skins and grind up the meat before mixing it with highly concentrated ethanol. This process produces a fluid that contains, "the flavor, rich color and essence of the salmon." Pardon me while I chum into my wastebasket. Blarrrgh. 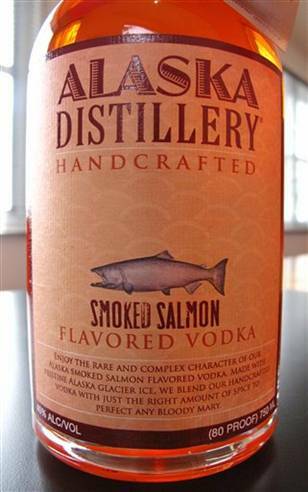 If you haven't had enough fishiness from Alaska to satisfy you for a lifetime, then check out the Alaska Distillery.